Canadian charity DAREarts, in partnership with the Stratford Festival, is empowering Indigenous youth aged 11 to 14 using the arts. The program responds to the Calls to Action from 'The Truth and Reconciliation Commission' by supporting youth education and Indigenous culture. It consists of multi-disciplinary storytelling that combines traditional teachings with contemporary communication methods: the stories will be shared through DAREarts YouTube to connect the Indigenous youths with all Canadians, and will help inform a 2017 Stratford Festival production, 'The Breathing Hole,' in honour of Canada's sesquicentennial. DAREarts is currently in Marten Falls (Ogoki Post) FN, continuing nine years with collaborating with Indigenous children, elders, education and community members to create art that empowers. A DAREarts team of four artist-educators landed last Monday in this northern, remote, fly-in-only community for a week of arts workshops to empower 30 kids, followed by a community showcase and feast yesterday. Team members are: DAREarts Lead Teacher Laura MacKinnon; musician/playwright/actor/artist Cathy Elliott; musician Glenn Marais; and Stratford Festival artist Michelle Jamieson. Community liaison for the team is Noront Resources' Kaitlyn Ferris. Marten Falls (Ogoki Post) FN is the community that Gord Downie wrote about in his depiction of 12-year-old Chanie Wenjack's attempt to walk home from Cecilia Jeffrey Indian Residential School. Chanie's story resonates with the youth today as they are dealing with the generational trauma that started with the Residential Schools and other destructive policies and practices. The children here, as in many Indigenous communities, are reaching back through their stories, language and culture to find a way. These children will have the future that Chanie was denied. Through a collective creation process in dance, drama, music, visual art, photography and videography, the youths will see themselves in positive ways and find their own voice. Focusing on Traditional Teachings combined with DARE values (Discipline, Action, Responsibility and Excellence) youth will build their confidence to be leaders as they reconnect with their culture, work collaboratively and become role models. After working in Marten Falls (Ogoki Post) FN, the team will work in Webequie FN next week and other remote First Nations in early 2017. The partnership with the Stratford Festival is fundamental to this year's DAREarts program. In August 2017, the Stratford Festival will premiere 'The Breathing Hole', a new epic allegory written by Colleen Murphy and directed by Reneltta Arluk. It tells of a polar bear encountering change on northern Canadian land through five centuries. In this partnership, Indigenous youths in each participating First Nation will share their own traditional story that involves a bear. Through their new creative works, they will provide impetus for the Stratford Festival professionals as they mount 'The Breathing Hole'. The youths' own works will be on display as a pre-show throughout the run of 'The Breathing Hole'. Of the program, DAREarts founder Marilyn Field says: "When DAREarts is invited into a First Nation, we bring in imagination, open minds and open hearts. What we hope to bring out is the capacity within each youth for courage to ignite positive change." Juno-nominated musician and artist-educator Glenn Marais adds, "The best part of this partnership in art and music is when the students so proudly take ownership of their work. The growth in self-esteem is clearly evident as they sing." DAREarts is a charity that empowers young at-risk Canadians aged 9 to 19 to ignite change as leaders. DAREarts stands for Discipline, Action, Responsibility and Excellence. Visit www.darearts.com to learn more. 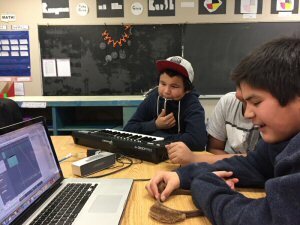 DAREarts 'First Roots' program partners with First Nations. 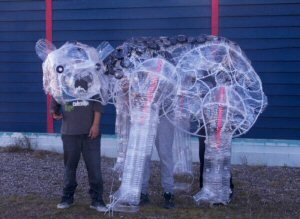 Upon invitation, DAREarts artist-educators fly into remote communities to work alongside youths, local artists and elders. Together, they address challenges such as school absenteeism, hopelessness and suicide. DAREarts' lead supporters are: Northbridge Insurance, Scotiabank, TD, Anne Livingstone and The Ontario Arts Council (an agency of the government of Ontario). Supporters of this program are: Palgrave Rotary Club; David & Teresa Thomas; Noront Resources; The Paul Semple Award; and Allan Drive Middle School. The Stratford Festival is North America's largest classical repertory theatre, presenting works of William Shakespeare and other great writers. It is the premier classical theatre destination renowned for both excellence and innovation. please contact: DAREarts Foundation Inc.
Marten Falls (Ogoki Post) youths engineer the song that youths created. Marten Falls (Ogoki Post) youths created a bear puppet out of water bottles for their multi-arts telling of their traditional bear story.